In recent years 14K gold baby rings have become more popular, and it's easy to understand why. The tiny rings are adorable and are a fantastic way to celebrate a baby's birth. Baby rings are rings that are small enough to fit a baby's fingers and are much thinner than standard adult rings. The rings frequently come in size 0 or 1, however because they are a potential choking hazard it is best to think of them more as a keepsake than jewelry for a baby to wear. Although it is not recommended that the baby actually wear the ring, the ring can be put on display in the baby's room or put on a gold chain and worn by the baby's mother. A baby ring can be a thoughtful gift and a lovely heirloom to pass down. There are many different styles of baby rings to choose from! While 14K gold is an excellent material for baby rings, the rings are also made from different metals, such as 10K gold, white gold, and silver. Baby rings often have a tiny birthstone gem or diamond chip embedded in them, but many have no stone at all. The sides of the ring can be engraved with a message or information about the baby, such as her name or birthdate. 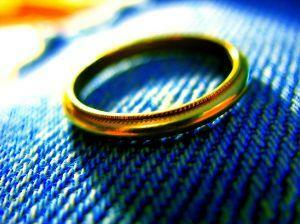 Other rings are engraved with pretty images, like hearts, and still others are plain. The birth of a new baby is a life altering event and deserves an extraordinary gift to mark the occasion. Why give yet another onesie, receiving blanket, or pacifier when you could give a beautiful baby ring? Or if you're the parent of a baby, why not purchase a baby ring for your own child? A sweet baby ring can become a family heirloom, passed down from parent to child for generations and is a unique idea for the baby who has everything. Walmart carries a beautiful plain, 14K gold baby ring. The Gingham Grasshopper offers a selection of delicate gold baby rings engraved with hearts and other designs. Saraff carries several pretty designs of baby rings that can also be ordered in larger children's sizes. For the fashionable baby, there's more than just rings out there to complete her ensemble. There are baby bracelets, charm bracelets, and even tiny earrings with special backs to keep them from harming the baby's delicate skin. This jewelry can usually be found at the same retailers that sell baby rings. While a baby ring honors the new baby, a mother's ring celebrates all of a mother's children and can be given at the same time as the baby ring. There are different types of mother's rings available on the market. One kind of ring has the birthstone of each of a woman's children. Another type is a stackable ring, a set of slim rings, each with the birthstone of a different child, that are meant to be worn together on the same finger. Like the baby ring, the mother's ring can be engraved with the names of her children, birthdates, or special messages.